New state and national regulations require new pool pumps to be either two-speed or variable speed. Variable-speed pumps run at a lower speed, but for a longer period of time so they’re able to achieve the same or improved sanitation results. Lower speeds require less energy and also reduces noise from the pump. High-speed functioning is still available for certain uses such as spa therapy jets or water features. By a small increase in upfront costs, these pumps can result in 75% – 90% savings on your electricity bill. A large-capacity cartridge filter can eliminate the need to clean your pool with a hose and save up to 2,500 gallons of water every season. 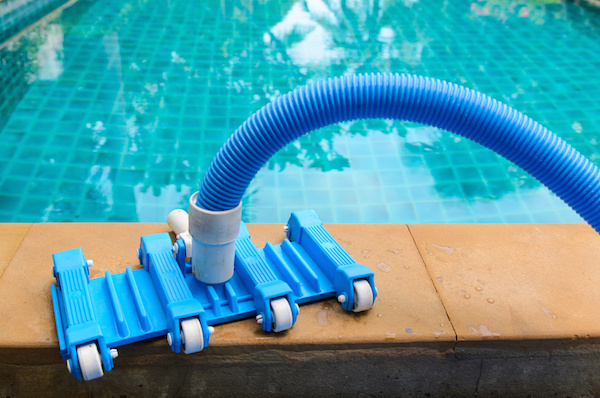 Automating your pool pump keeps your pool clean and reduces the time you need to spend maintaining your pool. You can set your pump to run based on your pool size, type of pump, and pool usage, or simply set your pump to run for several short periods throughout a day. Having a cover on your pool can reduce water evaporation by 30% – 50%. Not only is water loss being avoided, but pool covers help to reduce heat loss and cut down on required chemicals by 35% – 60%. A pool cover can save on time spent cleaning debris and also chemical water treatments. LED lighting uses 75% – 80% less energy than other lighting options. Following your AC and hot water expenses, pool filtration is typically the largest energy cost in a home. By choosing energy efficient features for your pool design, you can help to lower your energy costs and the environmental impact of your pool in the long-run. To learn more about energy efficient options for your pool remodel or design, contact the professionals at Aqua Blue Pools!